Edison2, the 2010 winner of the Progressive Insurance Automotive X-Prize for ultimate fuel efficiency, showed off the latest iteration, version 4.0, of its Very Light Car (VLC) at the Henry Ford Museum in Dearborn, MI, this week. Contrary to the methods other automakers use to develop a viable electric drivetrain, Edison2′s strategy is to cut vehicle weight and reduce drag as much as possible. One example is that the car has its suspension within its wheels in order to reduce weight. Check out Edison2′s press release below. An electric powered VLC was tested in the fall of 2011 and got the equivalent of 245 miles per gallon while offering a 114-mile single-charge range. It could recharge from a standard 110-volt socket in six hours. Edison2 won the 2010 X-Prize mainstream category with a VLC that weighed just 830 pounds and used a one-cylinder motorcycle engine that burned ethanol and gasoline. 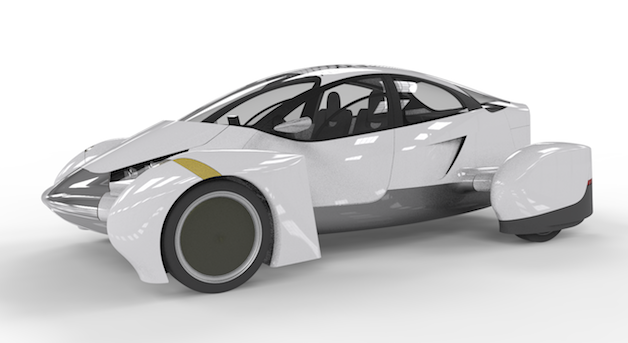 X-Prize winner Edison2 shows off Very Light Car, version 4.0 originally appeared on Autoblog Green on Sun, 14 Apr 2013 08:43:00 EST. Please see our terms for use of feeds.